December was another month of big swings for Carvana, but the stock ended 2018 up more than 70% on the year. Carvana (NYSE:CVNA) dipped 24.4% last month, according to data from S&P Global Market Intelligence. The automotive e-commerce company's shares sold off along with the broader market across December's worst percentage-base stock slide since The Great Depression. Check out the latest Carvana earnings call transcript. 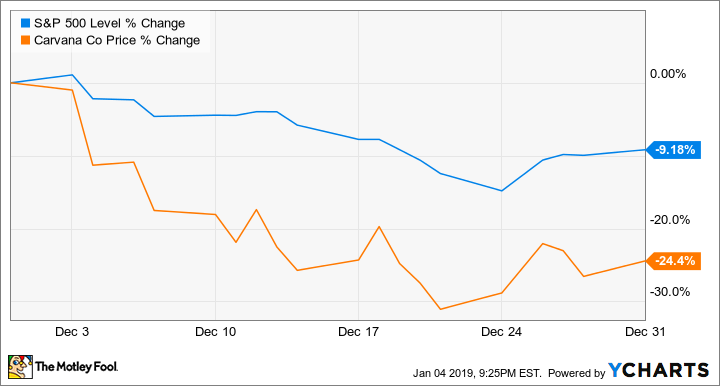 Despite shedding nearly a quarter of their value in December, Carvana shares climbed 71% across 2018. 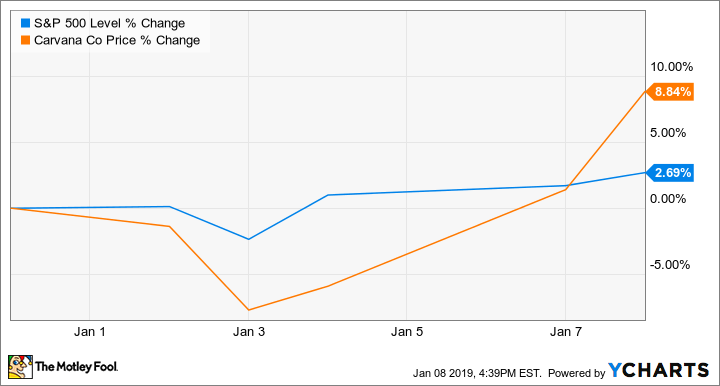 Big gains heading into the year's final month and the company's growth-dependent valuation help explain why the stock saw steeper declines than the broader market, even as the company's expansion efforts appeared to proceed apace. The news didn't have a big impact on Carvana's stock price last month, but the automotive e-commerce player did launch service in new locations and expand offerings in existing markets. The company rolled out service in Wisconsin and in San Francisco and San Jose, California, and it also opened a new vending-machine car outlet in Indianapolis. Carvana's business aims to simplify the car-buying experience by allowing shoppers to complete the entire purchasing experience online. Users can search for an automobile using a variety of criteria, review 360-degree photos and detailed info, and even return a purchased vehicle within seven days after delivery or pick-up. Carvana stock has regained some ground early in 2019 as the broader market has climbed, and it's trading up roughly 8.8% this month so far. Despite recent volatility, Carvana stock has more than doubled from the $15 initial public offering price it hit the market with in April 2017, and investor enthusiasm isn't without cause. The company's service offering appears to be a hit, and strong demand and expansion into new markets is driving strong sales growth. Total revenue climbed 137% year over year in its last quarter, marking the 19th consecutive quarter the business has delivered triple-digit sales growth, and the company expects to extend that streak with its fourth-quarter results -- guiding for year-over-year sales growth between 115% to 138%. What Drove Carvana 14% Higher Tuesday?